Just in case you haven't been paying attention, I am going to give you a short course in how to avoid becoming a victim of a phisher. 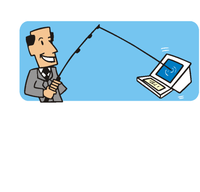 Phishing, as you should already know, is the fraudulent use of graphics from a legitimate website, in an attempt to get you to click on a link in an email that will take you to a phony site, and try to convince you that you are secure when you enter your user name and passwords. Pay attention. In every email that contains a highlighted link, move your mouse over the link, and look at the bottom of your browser to see where the link is REALLY sending you. Here is an example of what I got when I scrolled over an email today, ostensibly from PayPal: "http://www.arolosweyr.co.uk/.us/cgi-bin/paypal-security/webscr-cmd=login&run/secure/login/"
Now, what does this URL tell me? First, the website is in the U.K., a sure tipoff that it isn't really PayPal. Second, the use of a webscript (webscr) is a tipoff that the site is bogus. Finally, the "cgi.bin" is a dead giveaway. This is a site you DO NOT want to go to. In fact, some of the phishers are now spoofing the URL, and the site might not contain these keys. So, the only rule is, if you want to go to such a site, go to your browser, and manually type the web address of your provider. 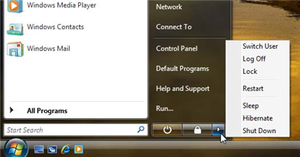 In addition, use FireFox 2, and load the Netcraft toolbar. If the site is risky, a little toolbar at the tip turns red. For some of you, this is all old hat. For the rest of you, though, be careful out there. Link: Microsoft to roll out new version of WGA. In the category of "too little, too late", Microsoft is attempting to mollify the thousands of us falsely accused of running a pirated version of XP on one of our computers, by creating a new category of Windows Genuine Advantage (WGA) violation, which will nag the user less often, and will provide trouble shooting tools. Right. If you believe that, I have some South Florida swamp land to sell you. One of the FutureLawyer's old computers, now used as a server, has received false positives from WGA, and I spent an annoying several hours figuring out how to disable it. Microsoft just doesn't get it, it is unlikely that it WILL get it, and I get angry all over again, remembering being called a "pirate" by the brain dead WGA software. Wait a minute! Now I remember! Linux! Ubuntu Linux! Open source! Web 2.0! The rally cry of freedom! Link: Excite News - Google Suffers Setback in Copyright Case. In its attempt to defend itself against a coalition of publishers and others attempting to assert copyright infringement in Google's venture into digitizing book content on the web, Google has subpoenaed documents and records about Yahoo and Amazon's similar digitizing efforts. However, attorneys for the competitors have filed objections, claiming that the information consists of trade secrets, and that Google has no business "getting into the minds of Yahoo employees". Yahoo's lawyers are probably right; but, as in most discovery disputes, the Judge will likely look for a way to get the relevant evidence in order to make a reasoned decision. How to protect the trade secrets will be the big battle. Along with privacy on the Internet, the big challenge of Web 2.0 and the emerging Internet is how to leverage the power of the Internet to make knowledge and information freely available to everyone, while still protecting the intellectual property rights of authors. 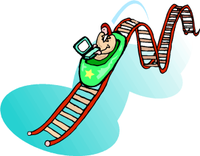 Those of us who want free information on the Web, but who respect private property rights, are experiencing a roller coaster of emotions as we try to resolve the problem.This should be quite a ride. Loki Toolbar - Where Am I? Link: Loki Toolbar Beta. Okay, I know. Just what you don't need is another browser toolbar cluttering up your page. However, this little beta may be an essential tool. You have the WiFi adapter in your computer already, why not put it to good use? Loki uses local WiFi to locate you, and to tell you what is around you of interest. You can send your location to anyone by email. You can pinpoint your current location and bring up a map instantly, without a GPS device. You can locate stores, restaurants, ATMs and whatever in your immediate vicinity. This is like having a free local guide in your computer when you travel. It's free to download and use. Link: Welcome to WebIS.net. FlexMail is a full featured email client for PocketPC. This application is Outlook like and will sync with Outlook as well as get POP email from various mailboxes. It downloads html mail with images, and, in general, operates just like Outlook on the PC. Free trial for 30 days. I bought it for $20 after using it for a day. Outstanding functionality for the road warrior. Link: The Tornado™ - File and Data Transfer Tool. This $60 gadget is cheap and does the job. Just plug it in to the USB ports of two computers, and the built-in software pops up, permitting file transfer at USB 2.0 speed back and forth. No software to install, and no USB thumb drives to carry. Carry one in your notebook case, and plug in to any computer for file transfer. Nice. CIA -Office of General Counsel - Who Would You Rather Work For? Link: Office of General Counsel - Who Would You Rather Work For?. This clever page from the CIA website shows that the Central Intelligence Agency has a sense of humor. It compares private sector law jobs with a job at the CIA's General Counsel's Office. You can read it for yourself, but, suffice it to say that, if you are willing to settle for a Government salary, there are perks, including paramilitary support and meeting contacts late at night in unfamiliar surroundings. Oh, yeah, and no 2600 billable hours a year. Link: Joel on Software. Friends, Windows Users, Countrymen. I come to bury Microsoft, not to praise it. One day after I actually got to write a post praising Microsoft's efforts to sue phishers into oblivion, I find this highly entertaining article from Joel Spolsky, a New York software developer, about Vista shut down choices. I have written volumes recently about Microsoft's new operating system (none of them complimentary). Spolsky points out that the team of Microsoft designers, software engineers, and other people that fill out the bloated Microsoft payroll, in an effort to justify their existence, have given the Vista user 14 options to choose from when they want to turn the darn thing off. It is bad enough spending 5 minutes choosing between log off, restart, and shut down in XP ( I never have figured out why they included log off or restart - just shut the thing off and reboot). Now, the user gets to choose between those options and, are you ready, Switch User, Lock, Sleep, Hibernate, and others. Puhleeze! Spolsky has a great quote about too many choices - they tend to cause inaction, and reduce productivity. Windows Vista - Just don't. Link: Translated version of http://chinese.engadget.com/2006/11/27/striker-ii-usb-laser-guided-missile-launcher/. 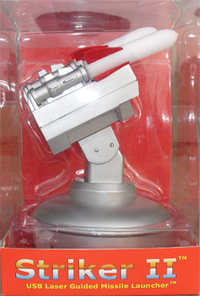 Okay, if you have GOT to have weapons at your desk, this Chinese USB laser-guided missile launcher is for you. Are there persons in your office that need personal destruction on a world war scale? Do you itch for the latest in laser-guided missile technology for your very own? All you need is a computer and a USB port, and you are a player on the weapons of mass destruction stage. And, to think, we have the Chinese to thank.Only $70. Think of the billions of dollars the military could save if they just shopped online. Link: One Laptop per Child. 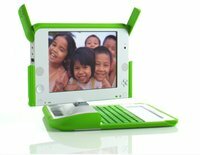 The OLPC project, about which I blogged in June of this year, OLPC - Best Use For Your Charitable Dollar? , is getting to the prototype point. The design is being tested in the field. It has to be child proof (that means dropped, kicked, thrown and every other thing), and the price point, now around $200, has to get down to $100. However, when accomplished, putting computer power into the hands of the world's least fortunate children will do more for world peace and harmony than all the world's armies can. Gee, what if we spent a billion dollars of money earmarked for weapons on laptops for kids? What a concept!